When a couple applies for a joint mortgage, the lender uses both of their incomes and credit scores to determine whether they qualify. And in many cases, dual incomes are required to qualify for a certain amount. Therefore, both parties are liable for the mortgage debt, regardless of any changes to their marital status. In a divorce, it’s certainly easier for a couple to sell the property and eliminate the mortgage debt. This way, they can take their halves and go their separate ways. However, there is no rule that says a couple has to sell the house — unless ordered by a court. The truth is, if you love your home and you want to stay, this is definitely an option; but unless you remove your spouse’s name from the loan, he or she remains liable if you default. And unfortunately, taking someone’s name off a joint mortgage isn’t as simple as calling your lender and making a request. 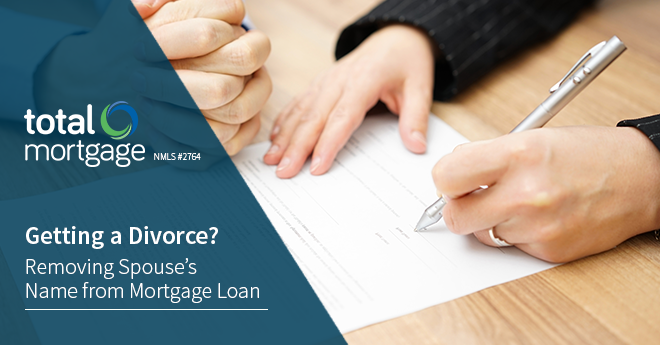 To keep your house after a divorce and take your spouse’s name off the mortgage loan, you’ll need to refinance the mortgage loan in your name only. Unfortunately, this can be tricky — especially if the original approval was based on both of your incomes. The fact that you already own the home doesn’t guarantee an approval. The lender will evaluate your credit and income to determine if you can handle the payments on your own. The bank will look at your payment history and your current debt to income ratio. Ideally, you’ll need a credit score of 740 or higher to qualify for a favorable interest rate. In addition, your income must be able to support the payments. As a rule of thumb, the mortgage payment cannot exceed 28% of your gross monthly income, and your total monthly debt payments cannot exceed 36% of your gross monthly income (some loan programs allow a higher percentage). If you’re approved for a mortgage loan based on your own credit and income, the next step is filing a quitclaim deed. Since your new mortgage loan replaces the old one, your spouse’s name is automatically removed from the mortgage; but refinancing does not remove his or her name from the mortgage deed. A quitclaim deed transfers property ownership between parties, and by signing this document, your spouse give up any rights to the property. Download a quitclaim deed from a legal website, such as LegalZoom, or have a real estate attorney prepare your document. You and your ex will meet with the lender handling your refinancing, and you’ll both sign the document in front of a mortgage loan officer. The loan office will notarize the document and file it with your county clerks office. Taking someone’s name off a mortgage loan can be a complicated, lengthy process; and in some cases, it’s easier to sell the home. However, if you’re adamant about staying in your home, refinancing and filing a quitclaim deed is the only way to retain ownership. Total Mortgage has exceptionally low mortgage rates. Contact one of our experienced mortgage experts to find out how much you can save. Get started today.